Hotel restaurant Kyriad La Roche-sur-Yon is a 3-star establishment located opposite the Arago sports complex, 5 minutes from the TGV train station and the historic city center, 10 minutes from the Vendéspace venue, 25 minutes from Sables d'Olonnes and 45 minutes from the Puy du Fou. Our team welcomes you every day 24 hours a day in English, German or Spanish, and the hotel provides free parking, unlimited Internet, and fully equipped conference rooms for your seminars. Its 65 rooms, totally renovated in 2010, in a contemporary zen style, offer you the ideal setting for your business and pleasure trips. 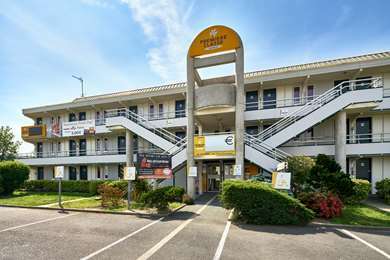 Hotel Kyriad is close to sports centers, the Actisud commercial zones, the Convention Center, the Oudairies Parc des Expositions, and the CHU and CHD, making it one of the best locations in La Vendée for access to both tourist sites and business districts. 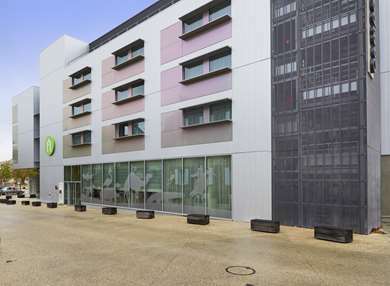 An 18-hole golf course is 10 minutes away, the Terres Noires complex is 15 minutes away, and Place Napoléon with its new design is just a few minutes away by car. Our rooms are all equipped with high end bedding, flat-screen TV, air-conditioning, free Wi-Fi, desk, telephone, shower, hair dryer, as well as a courtesy tray with a kettle, tea and cookies. The hotel has 65 rooms, including 3 specially adapted for people with reduced mobility. At Hotel Kyriad La Roche-sur-Yon, everything is designed and put in place to provide you with relaxation, freedom and comfort, whether you are here with your family or on business. From 6:00 am to 10:00 am, the hotel offers a very complete breakfast buffet full of flavor and vitality. As I booked through Booking.com, breakfast was not included in my bill. I was asked to pay at Check-In - no problem as I knew I would have breakfast. Having checked out the next day, I was sent a message through one of my colleagues that I had not paid for breakfast! Not only was this not true (I am lucky that I kept the credit card receipt as an invoice was not provided for either the room or the breakfast), but getting a third party involved like this is just not acceptable. Hotel what you would expect or the price point. Small rooms but quite comfortable. Lots of noise from the bar / corridors. And no restaurant the weekend - something they don't really share prominenetly enough. We booked on line which included breakfast,upon checking out we where told it was extra a long exchange of views ensued resulting in us not having to pay, the beer was mind wateringly expensive and the restaurant was closed!. Also the p!ace is full of mirrors just weird. Overall very poor never again. I am glad to hear from you as the voice of our customers as it is the only way to know how they feel. Thank you again for choosing our hotel. First of all I would like to thank you for this constructive comment. As we can see by your profile you use regularly hôtels in general and your appreciation are welcomed. Concerning the air conditionning, it's a system which either work on air conditionning either on Warming. It is impossible to use both at the same time. For your information we stopped the warming system for the moment and we planned to swich to air conditioning by June only, as we still have some days with 10-13°. The summer is coming very late in this part of France. I hope we will have the pleasure to welcome you again in our hotel.